This full-length junk journal tutorial takes you through the entire process from start to finish for assembling a journal. It will be especially helpful for newbies who don't know how to get started. It also features my method of creating a pamphlet stitch journal with a vintage hardcover book, where the stitches can't be see on the back of the spine. 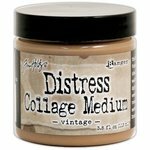 This collage medium is tinted to seal your project and give it an aged look. There are a few different finishes. I use this frequently on junk journal covers when I want additional aging/texture. 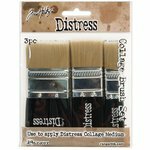 These brushes help you coat your project evenly with the collage medium. They are durable and easy to clean. They provide great coverage.